Jolly is just an ordinary snowman… or is he? Every night, after the family has gone to bed, Jolly comes to life! 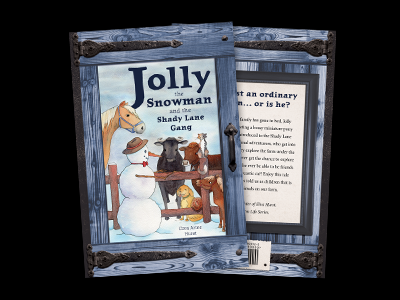 After meeting a bossy miniature pony named Maggie, he is introduced to the Shady Lane Gang, a group of farm animal adventurers, who get into all kinds of mishaps as they explore the farm under the cover of night. Will Jolly ever get the chance to explore the dark woods? And will he ever be able to be friends with Freckles, the sassy, sarcastic cat? Inspired by bed time stories told to the author as a child, you’ll enjoy this tale based on real animals on our farm. Written by the daughter of Elva Hurst, author of The Farm Life Series.